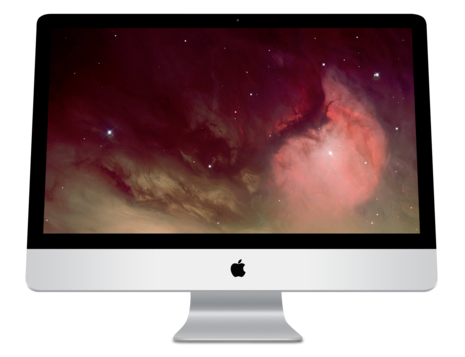 Apple has updated the iMac with Intel's more efficient Penryn processor, which has a larger level 2 cache and includes the SSE4 instruction set. The iMac has also moved from an 800 MHz system bus to 1066 MHz, and clock speeds now range from 2.4 GHz to a 3.06 GHz build-to-order option. The aluminum iMacs have 3 USB 2.0 ports, FireWire 400 and 800 ports, gigabit ethernet, 802.11n WiFi, Bluetooth 2.1+EDR, and an 8x SuperDrive - as well as a slim keyboard with USB 2.0 ports. The 20" 2.0 GHz iMac has 1 GB of RAM, a 250 GB hard drive, an 8x SuperDrive, Radeon HD 2400 XT graphics, AirPort Extreme, Bluetooth 2.0, and Apple's new keyboard and Mighty Mouse. The iMac is a range of all-in-one Macintosh desktop computers designed and built by Apple Inc. It has been the primary part of Apple's consumer desktop offerings since its introduction in 1998, and has evolved through four distinct forms. In its original form, the iMac G3, the iMac was gum drop- or egg-shaped with a CRT monitor, mainly enclosed by colored, translucent plastic. The second major revision, the iMac G4, moved to a design of a hemispherical base containing all the main components and an LCD monitor on a freely moving arm attached to the top of the base. The iMac G5 and the Intel iMac placed all the components immediately behind the display, creating a chunky unified design that tilts only up and down on a simple metal base. The current iMac shares the same form as the previous models, but is now thinner and uses anodized aluminum and black-bordered glass for its case.